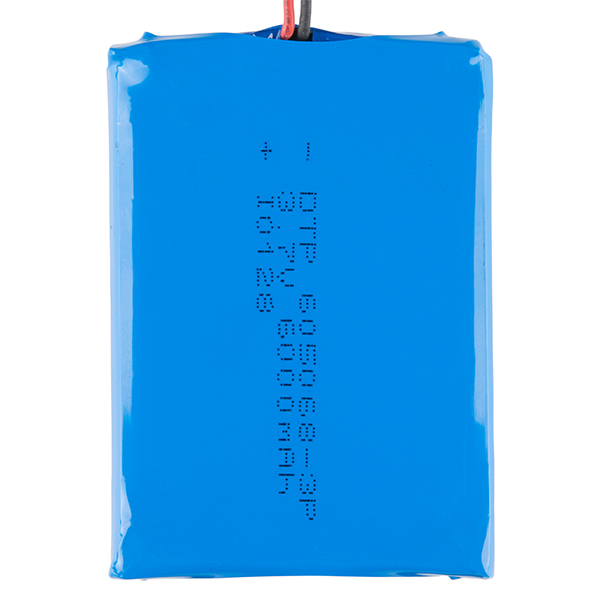 If you need some juice, this 6Ah Lithium Ion Battery is for you. These are very compact batteries based on Lithium Ion chemistry. This is the highest energy density currently in production. Each cell outputs a nominal 3.7V at 2000mAh! This solid 3 cell pack (6Ah) comes terminated with a standard 2-pin JST-PH connector - 2mm spacing between pins. Do not attempt to charge these with anything but a charger specifically designed for Lithium Polymer batteries. These three cells have been matched for internal impedance and can be fully charged and discharged in parallel. Please use caution when using this battery in wearable projects. When using conductive thread, a short in the thread can create sparks and heat. We recommend using coin cell batteries for beginners. You probably shouldn't. Since the 3 internal cells in the pack have been impedance matched with each other, you can apparently ignore the rule of not discharging and/or recharging them in parallel. I don't work for Sparkfun, but my guess is that there would be no guarantee that any two battery packs would be impedance matched with each other. Is it possible to charge this beast wth SparkFun LiPo Charger Basic - Micro-USB (PRT-10217) ? What's the recommended charger for this? Is there a curve floating around somewhere of the voltage or charge characteristics as temperature changes? Hello, I've been trying to use this 6Ah battery to power my LilyPad MP3 player, but it didn't work (no "power on" light, and there even was some very little smoke coming out from the Lilypad when I connected it ! ), while it works very fine with a smaller battery (a 850mAh). Is that normal ? Both batteries are Lipo 3,7V so I don't get it. Thanks for your help ! if i want to run my arduino at 5volts, can i stick two of these in parallel (giving 7.5 volts) and work that way, or is that just the wrong thing? 2 in parallel will give you 3.7V. 2 in series will give you 7.4V which will technically work, just make sure you don't charge them that way as charging Lipos in series is tricky. 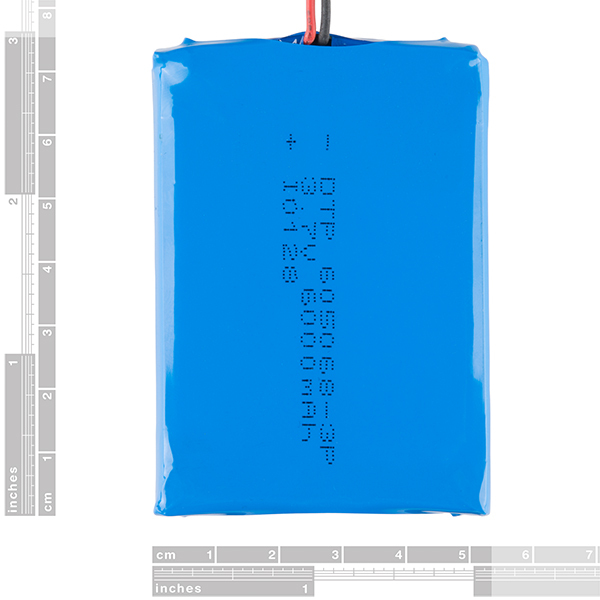 Also keep in mind that a fully charged Lipo is closer to 4.2V, that shouldn't be a problem, but just a reminder. Personally I'd just use one though. The ATMega328 should work fine at 3.7V even at 16MHz. In fact we've had no problems running the Open Log at 3.3V/16MHz (although it is just out of spec). All you GPIO will be at 3.7 and as long as whatever you have hooked to to the Ardunio is fine with that the Arduino should be fine as well. To do this you'll want to put the power on the 5V pin and not the Vin (which goes through the regulator). You'll also want to remove power from the 5V pin when you connect the board to the computer for programming so you don't have 2 sources on the 5V pin. I guess those are 3x 2A Batteries. Does each of them has Protection Circuit? Check your "normal charge current" math please. 6A * 0.2 = 1.2A Charging only at 22mA would take over 272hours, assuming 100% efficiency, to fully charge. This is tiny! My 2Ah phone battery is bigger! How is this 6 Amp Hours?! Could you charge 2 of these packs in parallel ? I use this battery to power the four motors on the Multi-Chassis Basic 4WD and am more than satisfied with its performance. Fully charged it provides around 4V. After using it on and off for weeks it wasn't even bellow 3.7V yet! A great product that saved me a lot of double A batteries! The dimensions do not provide a good fit for my project. Purchased a previous battery that was discontinued but fit perfectly with my project.Not sure what other options I have available. I have bought many items from Spark fun with no issues at all but this one has issues. The JST connector was smashed and not usable at all. Sorry to hear that your connector got roughed up in transit. If you'll contact our tech support team, they can get that straightened out for you. Very compact and plenty of power! I'm building a small radio transceiver using this as a power source and it's perfect! Using a Arduino compatible board with built in charger makes for a compact design. I have had this battery deployed in my solar powered weather station for 20 days. 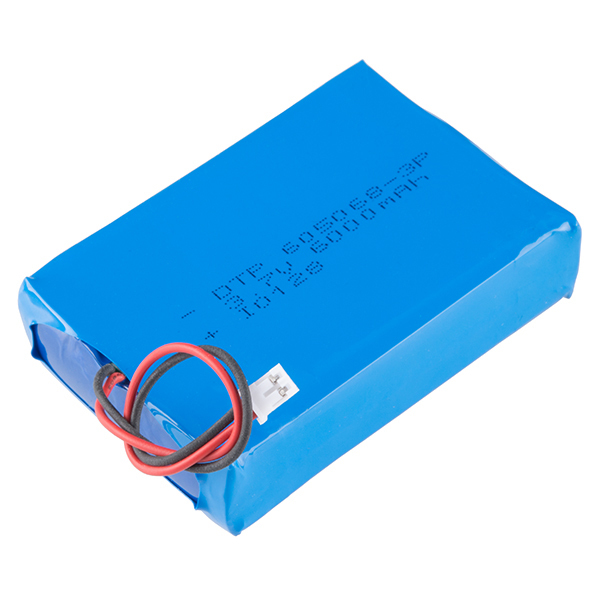 During this time the battery has operated reliably in temperatures ranging from 24 to 60 degrees F and relative humidity ranging from 40% to 98%. I've experienced no battery outages during this time. To see live info on battery/charge level go to http://intravisions.com/weather . For details on how the battery is hooked up go to http://github.com/fractalxaos/weather .